Lavasa is called a hill station but does not offer the cool comfort of one. In May and June temperatures touch nearly 40°C— not an ideal summer getaway. In nearby Mahabaleshwar, temperatures rarely cross 35°C. Then what prompted the city’s developer, Lavasa Corporation Limited (LCL), to promote it as a hill station? The answer lies in the state’s Special Regulations for Development of Tourist Resorts/ Holiday Homes/Townships in Hill Station Type Areas. The law, notified in 1996, allows a developer to choose 400 ha to 2,000 hectares (ha), at an appropriate height with suitable topographical features, and get the state to declare it a hill station. LCL got the government to tweak this policy to permit it to construct as it wished on the reservoir front and valley areas. To promote tourism, the regulations give developers certain concessions. “The rules relaxed the conditions for the transfer of tribal land and agricultural land for industrial purpose. The law was introduced to circumvent regional plans of districts so as make it easy for the builders to claim the picturesque valley,” said Rifat Mumtaz of Pune non-profit, National Centre for Advocacy Studies. The regulation contained certain conditions that did not suit LCL. It did not allow cutting of mountains; set a ceiling of 2,000 ha for developing a hill city; did not permit construction on gradients steeper than 1:5 (every five metre distance equals one metre height) and FSI of residential plots was limited to 30 per cent with a height restriction of two storeys. These were changed at LCL’s behest. What are a few inconsequential rules when project promoters have powerful friends. Once more, as in the case of Adarsh, rules were changed again and again and again, to make the illegal legal. On May 30, 2001, the Maharashtra government removed the upper limit of 2,000 ha in the hill station policy, allowing Lavasa to take as much land as it wished. The next day, the state urban development department changed the regional master plan of Pune to allow the hill station to be developed in the Sahyadris (Pune was one of the first districts to change its regional master plan following the change in hill station policy). The day after, on June 1, the Maharashtra government issued orders that 18 villages in Mulshi and Velhe talukas of Pune would be declared hill station. Within three weeks, LCL, which was then called Lake City Corporation, was granted in-principle permission to develop the hill city. In the original regional plan, the area was earmarked for afforestation. The speed shown by the government to change its hill station policy and master plan could be because the Lake City Corporation has strong political backing. The company had influential board members—Supriya Sule, daughter of Union agriculture minister and NCP leader Sharad Pawar, her husband Sadanand Sule and their close business associate Aniruddha Deshpande. The Sule couple owned 21.97 per cent share in the company which was rechristened Lavasa Corporation in 2004 (see ‘Who owns how much’). The Sules sold their shares in 2004 and withdrew from LCL, but the company did not lose political patronage. Vitthal Maniyar, who serves in the trusts run by the Pawar family, continues to be one of LCL‘s board of directors. In an interview given to Mumbaibased national newspaper, DNA, in December 2010, Deshpande said Lavasa is a “vision of Sharad Pawar”. The state water resources department, too, spared no efforts to help LCL. The Maharashtra Krishna Valley Development Corporation (MKVDC) leased 141.15 ha to Lavasa in August 2002, which included part of Warasgaon dam reservoir. “The government simply handed over a 20 km stretch of the river that was acquired for a public purpose to a private company,” says B G Ahuja, a former civil engineer with Central government, living in Pune. The order for issuing the lease, as documents with Down To Earth show, was passed by Ajit Pawar, who was then the state’s minister for water resources. He happens to be Sharad Pawar’s nephew. The lease between MKDVC and Lavasa was executed at rates far below the market rate. This transfer was illegal as the mandatory permission from the revenue department was not taken, says R Ramesh, former state revenue secretary. On Lavasa’s request, the state urban development department amended the hill station policy again on June 7, 2007. The original regulation said the development “shall in no case” involve hill cutting. The clause was changed to: the development “as far as possible should not” involve cutting the mountains. The amendment triggered haphazard cutting of hills. The amendment also made it possible to construct on steeper slopes with gradient of 1:3; the earlier policy allowed construction only on slopes with gradient of 1:5. The building norms were also relaxed to permit three storey structures in 25 per cent of the residential area. Lavasa wanted more concessions. The chief planner of Lavasa wrote to the urban development department seeking building law relaxations that would allow six-storey buildings and a town centre with mixed activities right on the reservoir’s bank. The government acceded to this request (see ‘Clearances fast-tracked’). On July 14, Sharad Pawar, along with then Maharashtra chief minister Vilasrao Deshmukh and Ajit Pawar, visited Lavasa, accompanied by senior officials. They met Lavasa officials at Ekaant, a resort in the town’s periphery. The minutes of this meeting, accessed by DTE shows, Ajit Gulabchand, chairperson of Hindustan Construction Company which owns 65 per cent of LCL, made a number of demands. These included reducing the no-development zone along the reservoir from 100 metre to 30 metre; designating LCL its own planning authority; allowing increase of height of buildings; permitting a mix of commercial and residential land use in the town centre and permitting a global (floating) FSI. Gulabchand gave a timeframe of four weeks to take necessary actions. The chief minister directed the officials to act expeditiously. These demands were met the next year. In June 2008, LCL was made a special planning authority with powers to plan and approve development in the area under its jurisdiction. A month earlier, the urban development department gave permission to use global FSI separately for residential, commercial and other sectors and reduced the no-development zone from 100m to 50m distance from the water body. All members of the special planning authority were from Lavasa, except one—Pune’s director of town planning. “The special authority hardly kept the government in the loop about the plans it approved. The layout plan was modified several times and FSI of the total project area was pooled to build highrises at one place. All this was not permissible,” says an official of the Directorate of Town Planning. He adds that global FSI was not used judiciously. This was brought to the notice of the Director Town Planning by an assistant director through a letter in July 2009. The letter says the company was seeking undue relaxations which could alter the basic nature of the Hill Station Regulations. The letter states that the regulations are not for just one hill station but for all hill stations in the entire state, and bending rules for one hill station could set a wrong precedent. The note was ignored. The Maharashtra Pollution Control Board (MPCB) gave Lavasa “consent to establish” in May 2002, much before the project received environmental clearance. In normal circumstances, the consent is given after a project obtains environmental clearance. A letter by member secretary of MPCB, to the Union environment ministry, dated July 15, 2005, says the work on the project was started in January 2003 with intimation to the collector; the project received environmental clearance only in 2004. In the same letter, the pollution board attempts to gloss over the illegalities at Lavasa which did not apply to the ministry for environmental clearance. The letter says, “since the project is located below elevation of 1,000 metre, EIA notification of 1994 was not applicable to the project and since work commenced in 2003, EIA notification of 2004 was not applicable.” The letter also assures that the developer was “scrupulously following the environmental management plan and carrying out environmental monitoring as recommended by NEERI in its EIA. The pollution board also issued consent for stone crushing of 1,500 tonnes a day in April 2004. 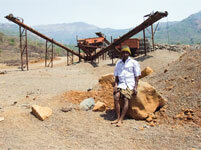 This has resulted in large scale stone quarrying in the eco-sensitive Western Ghats. A 2009 interim report by the People’s Commission of Inquiry, a commission of lawyers and activists set up by non-profits to probe land deals and displacement of people because of projects in the Sahyadris, says various government departments granted a total of 31 clearances in a short period between 2002-2003. “The bureaucracy moves at a snail’s pace in India. But the way government fast-tracked Lavasa was amazing,” says Rifat Mumtaz of National Centre for Advocacy Studies. 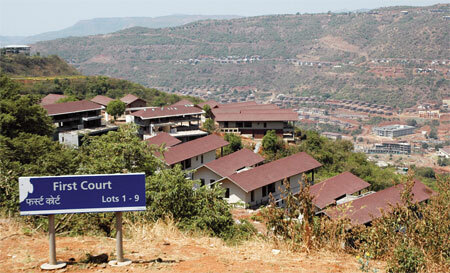 Lavasa has also been accused of acquiring land illegally for the project. If activists of the National Alliance of People's Movements (NAPM) are to be believed, 372 ha with LCL was acquired by the state under Maharashtra Agriculture Land (Ceiling and Holding) Act of 1961. Under the Act, land in excess of the ceiling limit is acquired from landowners and distributed to the landless. The government transferred this land to Lavasa, not the poor, activists say. “This land was identified in 1973, but was never acquired by the government till LCL set up this project,” says Sunithi S R of NAPM. The reason proffered for the land transfer can be found in a letter sent by the collector of Pune to the revenue department in Mumbai. The letter dated January 9, 2005, says the government would earn only Rs 1,02,736 if the land was given to the poor, instead of Rs 1.65 crore if the it is given to LCL. “The comment shows the apathy of officials towards poor in a welfare state,” says Sunithi. Maharashtra’s revenue secretary declined to speak on the land transfer, saying the Legislative Assembly was in session. But former revenue secretary R Ramesh Kumar says if at all the land was to be transferred to LCL, the company should have paid 75 per cent cost of land to the government as nazrana. Instead, they paid only 2 per cent of the land cost as tax. Ramesh said about 90 ha purchased from tribal families in the area was illegal as no permission was taken. As secretary, Kumar says, he had pointed out these discrepancies but the government ignored them. The revenue department exempted LCL from paying stamp duty on all land transactions. The people’s commission’s initial findings in Mugaon village says 65 families have lost nearly 135 ha to Lavasa without getting proper compensation. There are complaints of fraud, too. Bandya Bhau Wahelkar, 65-year-old resident of Mugaon, says the 6 ha he was allocated under the land ceiling Act was sold twice without his knowledge. The land records of Mugaon state it was sold to a couple Sharada and Suresh Shetty, who later sold it to a person named M R Diwakar. Walhekar says he did not meet any of these three persons. “When I tried to block access to my land with boulders to prevent mining, company workers threatened me twice with a pistol,” he adds. There may be more land acquisitions in the offing, but the extent of the city’s spread is still uncertain. Lavasa’s red herring prospectus, filed in preparation for its initial public offer, says that Maharashtra has declared 18 villages in Mulshi and Velhe talukas in Pune, measuring about 9,313 ha, as hill station. LCL has so far purchased 3,830 ha, but has applied to the Union environment ministry to give clearance for 5,000 ha. LCL has applied for environmental clearance for 7,000 ha from the Maharashtra state EIA authority. Lavasa may not be the only hill station in the offing in Maharashtra. In Pune district itself, three companies— Satind Infrastructure Private Ltd, Aqualand India Private Ltd and Maharashtra Valley View Private Limited—are planning to build hill stations in the Sahyadris. Any developer with 400 hectares of land can go ahead and build his dream town. But the fragile ecology of the Western Ghats may take a beating. There are lessons that need to be learnt from Lavasa, else more townships will emerge in the hills by bending laws and breaking regulations. Will the MoEF set another example like it did with Adarsh society or will the Western Ghats become second or third or fourth home for the affluent.